The ancient tradition of the Joint Hindu Family is referred to as a Hindu Undivided Family or HUF for the purposes of income tax. There are several tax advantages to running a business or earning under various heads of the Income Tax Return form that can save a big chunk of taxable income should you choose to create a HUF by law. You can pool valuables, estates and other assets to form a large corpus of funds in a way that is different from other forms of business organization. Any Hindu couple headed by a Karta, male or female can come together to form a HUF, even Jains, Sikhs and Buddhists can make a HUF. A HUF has its own PAN and files tax returns without implicating this liability on its members. HOW forming a HUF CAN SAVE TAX FOR YOU? A HUF is taxed in a pretty different way from its members, that’s the primary reason because of which reduction from taxable income is allowed under tax law and can be claimed by it independently. For e.g: If you and your spouse along with your three children form Hindu Undivided Family, all five of you and the HUF can claim tax exemption under section 80C. If a family is trying to build assets, a HUF is all that they need to turn into. The rates of taxation for HUF are just like an individual’s taxation rates. The exemption under Section 80 and other tax deductions can be claimed in their income tax return by the Karta of a HUF. HUFs can take an insurance policy for the members of the family. HUFs can make some investments from their income, but any returns from these investments are taxable in the hands of the HUF. If HUF pays salary to its members who are giving their fair share to the work or the joint business of the HUF, then this salary can be reduced from the taxable income of HUF. WANT TO FORM a HUF? According to Hindu law (both Mitakshara and Dayabhaga schools), a HUF is headed by a Karta who should be the eldest male member of the family. But a 2016 Delhi High Court order has finally given women, namely, the eldest female member the right to be Karta of a HUF. 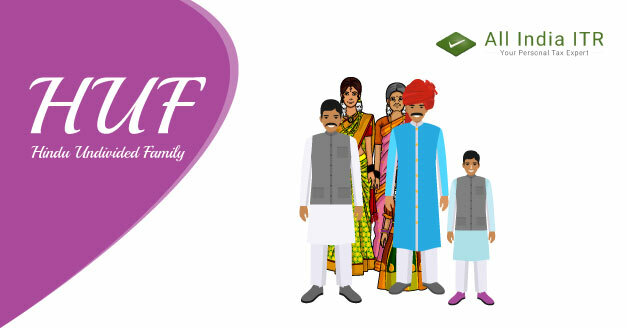 Since the HUF is being formed for tax purposes, you can start one by making a HUF deed, applying for a Hindu Undivided Family PAN card and opening a HUF bank account. Custom dictates that marriage by itself is enough evidence of the existence of a Hindu Undivided Family but financial institutions increasingly insist on a formal deed spelling out the names of the Karta and co-parceners in the joint family. A co-parcener is that member of the joint family who is entitled to a right in the family assets/ property and demand partition of shares from the Karta. Note that if a partition is challenged and goes to the court, the justice system usually settles matters by equally distributing rights to all parties concerned. An individual cannot form HUF, it should be formed by a family. A HUF is simultaneously created at the time of an individual’s marriage. To form HUF, you must have the same ancestor including the lineal descendants including their daughters and wives. Other than Hindus, Buddhists and Jains can also form HUF. HUF mainly comprises of the assets that are acquired as a gift, a property acquired by selling a or buying a joint family property, an ancestral property, a will or a common pool by the members of the HUF. When you make a HUF, you should get a formal registered name, you must make a legal which would have the names of the HUF members and the business. After this process a PAN no will be issued, and a Bank Account will be opened. By making a HUF you can certainly save yourself from shelling out a lot of money as income tax. Visit us on www.allindiaitr.com if you have any tax related queries. AllindiaITR is a product of Corwhite Solutions Private Limited. Thnx for this this really help me alot.This blog is really helpfull for us to know more about hindu undivided taxes law. This tell us everything that we should know about ITR. This is like a algorithm to fill taxes becaute it tell us step by step how we should fill taxes and yes it is also easy to understand. It tell breifly and accurately about taxes. The best thing about this blog is that we can get every information hear only. we shoud not go on different side to search about itr. It’s really great that u take initiative to tell people about this and your way of representation of thought is really good.We can understand out problem very easily and get our answers faster.Great keep it up. Excellent work by ITR.This blog conatins details in breifly and accurate manner about tax laws. None of the tax or investment blogs or websites provide such in detailed describtion about “Hindu Undivided Family in Tax Law? “.It’s really great that u take initiative to tell people about this and your way of representation of thought is really good.We can understand out problem very easily and get our answers faster. Though HUF seems like the perfect way to save tax as a family,does it contain any drawbacks.? This is very useful article for us because of this article now I came to know all about HUF and how we can able to claim tax exemption under section 80C, now I know pitty well about HUF and their tax rates also the profits from that it can take an insurance policy for the members of the family. I wanna ask one thing that in case of marriage or additional member of family so where and how can we maintain HUF. Amazing blog has really helped me alot. This really helps and tells a process that is required to fill up an Income tax return. This blog tell us step by step how we should fill taxes and yes it is also easy to understand. Each and every details have been mentioned in simple and clear language. i would prefer anyone to have a eye on it to clear all their doubts. The best thing about this blog is that we can get every information hear only. we shoud not go on different side to search about itr. Great work keep it up.It tell breifly and accurately about taxes. The blog is very detailed and the way it explains us about the tds and its importance is what alot of people dont know about, every thing is very easy to understand and to retain it really helps a person on how to fill up the ITR and how to enquire about it. Great work from ALL INDIA ITR since it is a very well written and a very useful blog.